France Adapter Plug Kit has the adapters you will need for traveling to all parts of the gorgeous country of France. Deluxe Adapter Kit: Includes two France adapter plugs and ships Priority Mail with tracking. Standard PLUS Adapter Kit: Includes one France grounded adapter and one dual voltage Travel Power Surge Strip with built in surge protecton. Standard Adapter Kit: Includes one France grounded adapter. Basic Adapter Kit: Includes one France non-grounded adapter. Deluxe kit ships priority mail with tracking. France adapter plugs allow you to plug your United States appliances and electronics into France wall outlets. France Adapter Plug Kit has the adapters you will need for traveling to all parts of the gorgeous country of France including Paris, Bordeaux, Aix-en-Provence and Strasbourg. Europe Adaptor plug allows US, North America, China, Australia and Mexico appliance plugs to be used in Continental Europe such as France, Germany and Spain. France operates on 230 volt electricity and is generated at 50Hz (Cycles) Alternating Current. United States 110-120 volt electricity is generated at 60Hz (Cycles) Alternating Current. This difference in cycles may cause the motor in your 60Hz United States appliance to operate slightly slower when used on 50Hz foreign electricity. Most modern electronic equipment including battery chargers, Lenovo, HP, Asus, Toshiba computers, iPods, etc., will not be affected by the difference in cycle. Check to make sure your hair dryer, curling iron, hair straightener, electric razor, electric water heater and other electrics are dual voltage. If your electrics are not dual voltage you will need a converter to take along your appliances. Bonjour Paris, Avignon and Lourdes! France is located in Western Europe, bordering the Bay of Biscay and English Channel, between Belgium and Spain, southeast of the UK; bordering the Mediterranean Sea, between Italy and Spain and its area is slightly less than the size of Texas. France is the largest West European nation Its climate generally cool winters and mild summers, but mild winters and hot summers along the Mediterranean; occasional strong, cold, dry, north-to-northwesterly wind known as mistral. 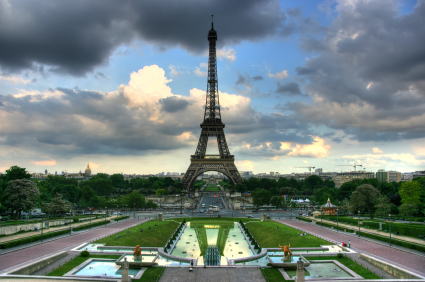 On average, France receives 31 inches (786 mm) per year. Spring is the wettest time of year in France. The terrain is mostly flat plains or gently rolling hills in north and west; remainder is mountainous, especially Pyrenees in south, Alps in east. Currency in France is the Euro (EUR). Credit cards are widely accepted throughout France. Foreign currency and travelers cheques can be exchanged in most banks; however ATMs offer a better exchange rate and are more convenient. Travelers cheques are accepted in most hotels and restaurants. The telephone system in France is highly developed with extensive cable and microwave radio relay; extensive use of fiber-optic cable; domestic satellite system. Cell phone coverage is great. When travelling to France you will want to take an international or unlocked cell phone with a prepaid France SIM card. You can also contact your mobile service provider to set up an international calling plan. You will need an adapter to charge your phone. Most cell phone battery rechargers should be multi-voltage, therefore will not require a converter. If the charger says 100-240 volts, 50-60 cycles then your charger in multi-voltage. France has 16.840 million internet hosts and over 45.262 million internet users. Internet access is widely available in hotels, internet café and Wi-Fi hotspots. When traveling with your laptop or iPad you will need an adapter to charge your device.